I’ve always looked past LAB Series products and after much thought and consideration, I honestly don’t know why. I’ve always been very ‘anti’ specific men’s products with the exception of Clinique for Men, but after reading so much good press over the years, I thought it was time to take the dive. 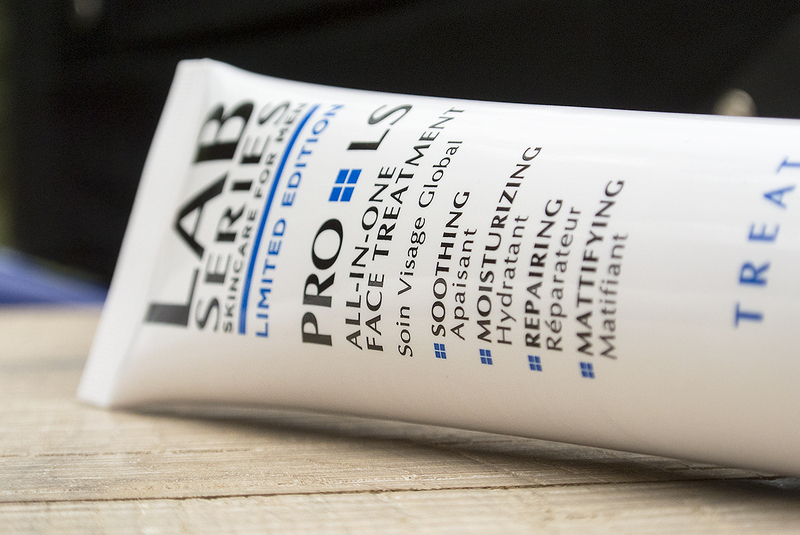 The LAB Series Pro LS All-In-One Face Treatment is just that, it’s your treatment serum, post-shave balm and moisturiser all in one. Designed to sooth, moisturiser/hydrate, repair and mattify the skin all in one tube/pump bottle (side not – mine is the limited edition tube, it normally comes in a tall pump; the product is exactly the same). It contains a whole host of both natural and artificial ingredients with the naturals including grape seed extract, two types of algae (powerful anti-inflammatories), rosemary, hops, tangerine, pomegranate and caffeine. The long term effects are promising with skin tone looking more unified, brighter and healthier. I wouldn’t say this is the best product for a sensitive skin type for two reasons: firstly the ingredients are effective yet powerful and secondly, if you’re prone to sensitivity, you should break down and separate your routine as much as possible in order to better eliminate those products that may cause a reaction (you can’t exactly remove the serum or mattifying properties of this product). It sinks in easily and is excellently nourishing whilst really living up to its promises of mattification (I think every guy under the sun looks for a good matte finish). Use only a very small amount and avoid the eye area in favour of truly dedicated eye cream (maybe take a look at Origins GinZing for dark circles and brightness). LAB Series Pro LS All-In-One Face Treatment is available for just £23 here directly from LAB Series UK. This article first appeared on MANFACE written by Thom Watson. It was published on Friday 11th July 2014 and was last updated on Monday 3rd April 2017 at 2:01pm. It's categorised under Lab Series, Moisturise, Serums & Treatments where you'll find more related content. This looks amazing! Definitely worth a buy and try!